As Nephi laid out the key elements in the “doctrine of Christ,” he mentioned being able to “speak with the tongue of angels, and shout praises unto the Holy One of Israel” (2 Nephi 31:13–14). This perplexing phrase must have been confusing for his people, because Nephi then added, “I suppose that ye ponder somewhat in your hearts concerning that which ye should do after ye have entered in by the way” (2 Nephi 32:1). Spencer proposed, “Nephi offers in 2 Nephi 31 a promise that the obedient can, as Lehi had done, join the angelic council to sing and shout praises.” Comparing 2 Nephi 32:2–3 to Nephi’s experience speaking with an angel (1 Nephi 11) and Isaiah’s heavenly vision (Isaiah 6; quoted by Nephi, 2 Nephi 16) strengthens Spencer’s suggestion. An angel guided Nephi through his sweeping vision in 1 Nephi 11–14. Before he speaks with the angel, however, Nephi is interviewed by “the Spirit of the Lord” (1 Nephi 11:1–6). LDS Biblical scholar David Bokovoy has argued that the Spirit was functioning as a “council witness” proving Nephi’s worthiness to receive higher knowledge from the divine assembly. In Nephi’s experience, it was through the Holy Ghost’s witnessing power that he was able to speak with angels (cf. 2 Nephi 32:2–3). In 2 Nephi 31:13–14, first Nephi, then the Son, makes receiving the Holy Ghost a prerequisite to speaking with the tongue of angels. In each case, the Holy Ghost is dubbed the “baptism of fire,” and Nephi stresses that “a remission of your sins” comes “by fire and by the Holy Ghost,” after water baptism (2 Nephi 31:17). 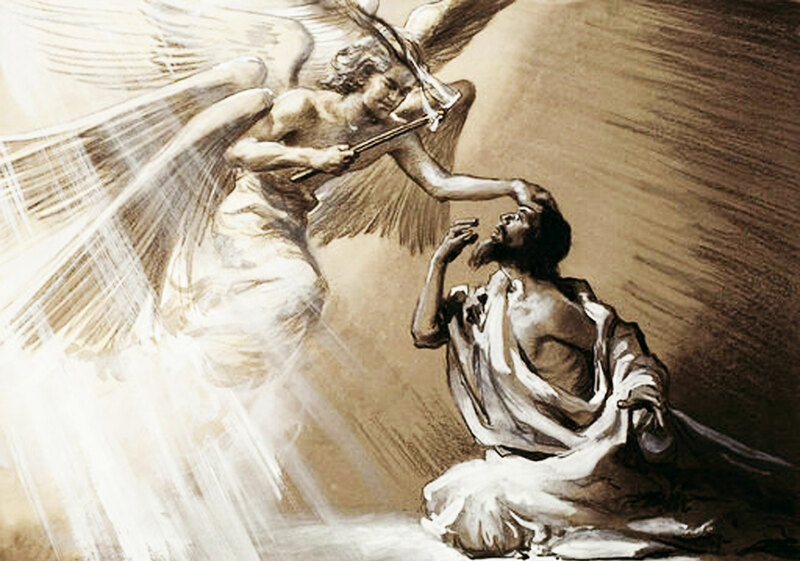 These sacred expressions, in the ancient mind, connected the angels of heaven with the white-robed priests of the temple. Isaiah was in the temple when he saw a “fiery one” (Isaiah 6:6); and Nephi was on a high mountain—a symbolic temple—when he was escorted by an angel, even the Holy Spirit of the Lord (1 Nephi 11:11). Lehi’s seeing the pillar of fire coming down upon “a rock” (1 Nephi 1:6) may well have signaled to him the arrival of God at His temple built upon a rock (Psalms 27:5). Those who ministered in the House of the Lord were spoken of as angels, for example in the Thanksgiving Hymns of the Dead Sea Scrolls, all the members of the Lord’s council are spoken of as “those who share a common lot with the Angels of the Face” (1QH 6). Figure 6 In the temple we can symbolically enter into the presence of the Lord and speak with the tongue of angels. Today, worthy Latter-day Saints ritually ascend into the presence of God in temples across the world. For Lehi, Nephi, and Isaiah that ritual experience symbolized a literal ascent into the Lord’s presence. And that invitation for all who are worthy to come into the Lord’s presence and be exalted as a member of the heavenly assembly—one of the sons of God—has been extended in these last days (see Doctrine and Covenants 76:50–62). Ultimately Nephi invites all his readers to find the way to enter into the presence of the Lord and to participate in the divine council as one of the “angels.” Joseph Spencer refers to this as “angelicization,” but since the “angels” or the hosts are divinities sometimes called “gods” and “sons of God” in the Old Testament, the common scholarly term “deification” could apply. Latter-day Saints typically call this exaltation. Anyone speaking under the inspiration of the Holy Ghost is, in one important sense, “speaking with the tongue of angels.” But we have explored another exalted meaning which enriches Nephi’s specific language. In addition to demonstrating the beauty, sophistication, and complexity of the Book of Mormon, this new interpretation brings clarity to an unusual phrase in Nephi’s writing. It also inspires sacred worship today and serves to show that a significant Restoration doctrine (exaltation) often thought to be absent in the Book of Mormon is taught by one of the earliest prophet-writers in the book. See Joseph M. Spencer, An Other Testament: On Typology, 2nd edition (Provo, UT: Neal A. Maxwell Institute for Religious Scholar, 2016), 51–52. Emphasis in 1 Nephi 1:8 and 2 Nephi 31:13 reflects Spencer’s emphasis. See David E. Bokovoy, “On Christ and Covenants: An LDS Reading of Isaiah’s Prophetic Call,” Studies in the Bible and Antiquity 3 (2011): 38–39. Spencer, An Other Testament, 51. John W. Welch, “The Calling of Lehi as a Prophet in the World of Jerusalem,” in Glimpses of Lehi’s Jerusalem, ed. John W. Welch, David Rolph Seely, and Jo Ann H. Seely (Provo, UT: FARMS, 2004), 432. Spencer, An Other Testament, 52. See David Bokovoy, “‘Thou Knowest That I Believe’: Invoking the Spirit of the Lord as Council Witness in 1 Nephi 11,” Interpreter: A Journal of Mormon Scripture 1 (2012): 1–23; Book of Mormon Central, “How Did God Call His Prophets in Ancient Times? (1 Nephi 15:8),” KnoWhy 17 (January 22, 2016). It may also be relevant that Lehi’s vision of the council was preceded by a “pillar of fire” (1 Nephi 1:6). Margaret Barker, On Earth as It Is in Heaven (Edinburgh: T&T Clark, 1995), 24. 1 Clement 34, quoted and discussed in Margaret Barker, Temple Mysticism: An Introduction (London: SPCK, 2011), 71. See Stephen O. Smoot, “The Divine Council in the Hebrew Bible and the Book of Mormon,” Studia Antiqua 12, no. 2 (Fall 2013): 5–6 for the list of titles applied to members of the divine council, with several biblical references included for each. On deification, see Keith E. Norman, “Deification: The Content of Athanasian Soteriology,” FARMS Occasional Papers 1 (2000). See also Barker, Temple Mysticism, 63-71, where she unravels the divine singularities and pluralities of the ’elohim, the hosts of heaven, and the Angels of the Presence.